Ping is one of the most basic commands in network management, verifying network connectivity through the roundtrip times taken by the ICMP protocol packets sent to a target host. Ping, enhanced ping, SNMP ping, proxy ping and graphical ping are predominantly used to check network availability and health. 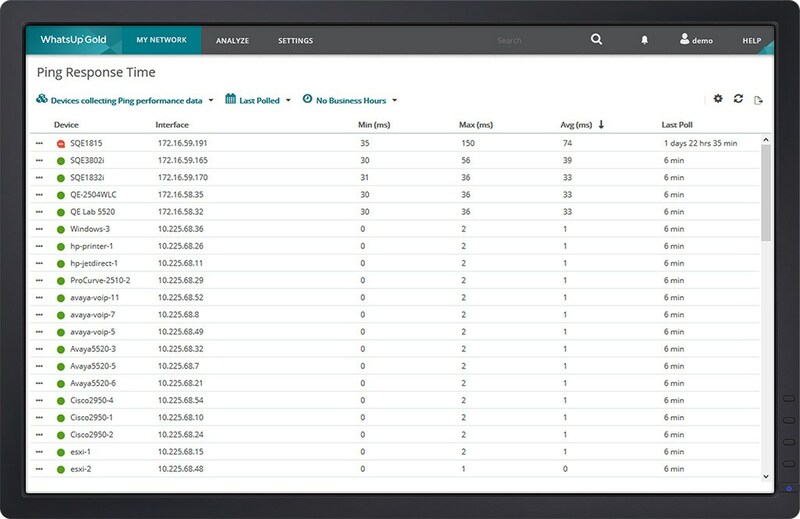 All network monitoring software comes loaded with a ping monitor tool to constantly monitor network availability, uptimes, connection state and statistics. Ping monitors use regular pings to automatically check device connections, detect outages and downtimes. They also provide ping statistics information including uptime, lost packets, failed pings, maximum/minimum and average roundtrip times for the ICMP packets – these can then be used to evaluate the status of the monitored connection. Ping monitors are configurable, and the administrator can predefine statistics like timeout, payload size, and the number of retries before a connection is considered down. With the advent of IPv6 in network addressing, network monitoring solutions are increasingly equipped with ICMPv6 (ICMP for IPv6). This allows the monitoring software’s ping monitor tool to send ICMP pings that can distinguish between the address types and hence use the correct version depending on the IP address provided. WhatsUp Gold, for instance, supports both IPv6 and IPv4 ICMP, and provides comprehensive monitoring for devices enabled with both versions. A ping monitoring tool is an essential component of monitoring software. Combined with a robust alerting and notification system, ping monitors can be used to monitor, notify and report the changes occurring in network connectivity.